Lean Simulations: Bingo! Make your lean presentation interactive with this fun game! Bingo! Make your lean presentation interactive with this fun game! It's time to apply lean thinking to the bingo hall. Ever wonder how you could make a bingo hall more efficient? Me neither, but I'm sure somebody is working on it. And it won't be me because today we're going to do the opposite. We're going to apply "bingo hall thinking" to lean! Are your lean training slides a little dry? Are people falling asleep listening to you blabber on about the early days of automotive production? 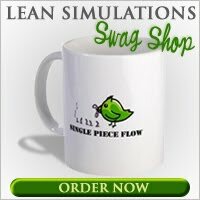 The answer is this great little lean game from 5Ssupply.com. 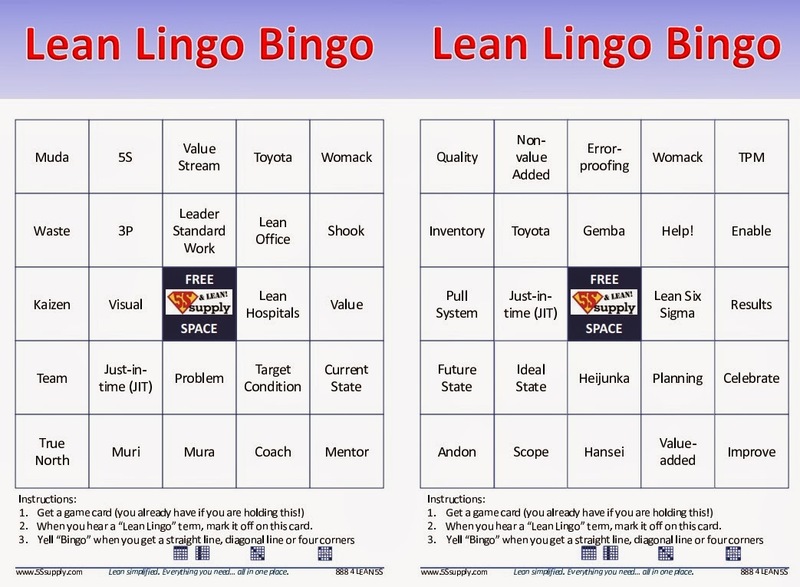 Once you introduce "Lean Lingo Bingo" to your group, they will be nailed to every word you say... guaranteed! Each member of your audience gets a bingo card before you start your presentation. On each card is a series of words related to Lean, in a random "bingo" pattern. Tell your audience to cross off any words that they hear you say. Following standard bingo rules, they must shout out "Bingo!" as soon as they complete a line. Lean Lingo Bingo is a lean word game offered as a free download by 5Ssupply.com. You can find the download page here. You hear Lean terms bandied about, so have fun with them! Lean Lingo Bingo is a fun way to promote Lean terms and phrases during training, meetings or even Kaizen Events! 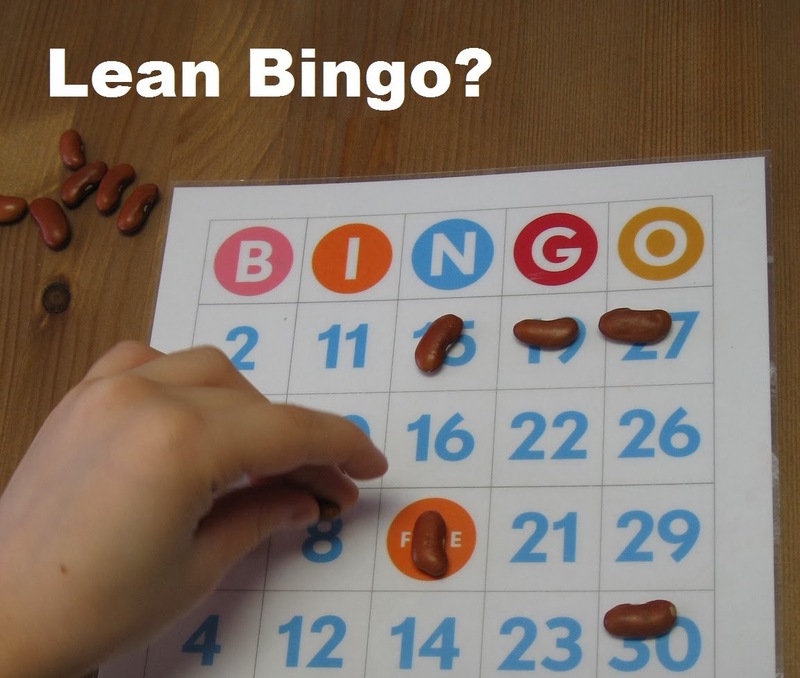 This free download gives you 28 different Lean Lingo Bingo Cards to play with. Just print out the cards, cut in two (two cards per page) and start playing! Forces you, the trainer, to touch on a wide variety of subjects. You can tailor the training to the bingo cards. Teaches everyone the basic lean vocabulary, so we're all on the same page. Yelling "Bingo!" wakes up the sleepers. It's a game and everyone loves games! Although 5Ssupply.com is a web-based store, you do NOT have to enter any payment information to get this free download. Just add it to your shopping cart and check-out. You just have to enter your email, and Lean Bingo will get sent to your inbox. I've added this game to the now monstrous list of free lean games and simulations. This looks like a really nice game, I'll definitely try it out - thanks for bringing it to my attention! Sounds like a fun game to try. Thank you for sharing! WHO WE ARE? / WEB SERVICE / PPC SERVICE / CONTACT AM AT AM INDIA / CANADA / UNITED KINGDOM / FRANCE / SPAIN / CZECH REPUBLIC / AZERBAIJAN / PERU / BRAZIL / GEORGIA / ETC.. CALL NOW FOR COMPREHENSIVE ADWORDS MANAGEMENT CONSULTATION, MEET EVERY NEED! Contact us today! To know more about our Google Adwords Services or PPC Campaign Management Services. ADVERTISE ON GOOGLE, BING , FACEBOOK STARTUP NEVER STOP Long Term Contracts. Flat Fees. Growyour Digital Marketing PresenceNow.